I'm starting to understand the benefits of spending so much time pin curling your hair. If you take care of it, it can last for days. After yesterday's style, I decided to see what would happen if I re-pinned my hair in larger sections and slept on it. I chose to do the larger sections because I didn't want to redo the small sections because I'm lazy, and I was hoping that by doing larger sections the curls would not be so tight. It worked out very well and it took much less time. 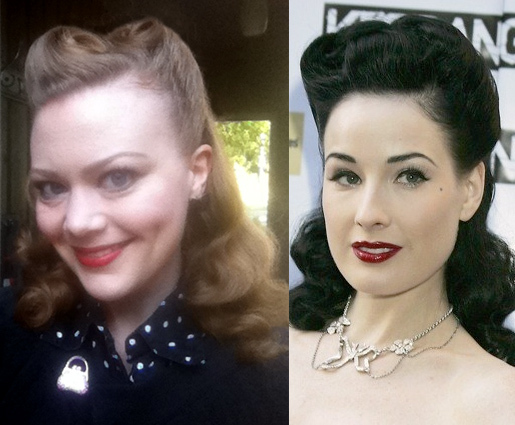 So, this mornings hair style is very similar to a style I recently saw on Dita Von Teese. I created victory rolls on the sides and a small roll in the front. This is more of a 1940's look. And because I don't want to reinvent the wheel and she does it so well, here is a tutorial on how to do a victory roll by one of my favorite Youtubers: Cherry Dollface.